Though an identity thief is more likely to go on a retail shopping spree than seek professional services, collision repairers should still take note of some major new credit card rules launching in October. Starting Oct. 1, any merchant who swipes a traditional credit card stripe instead of a more secure EMV chip could be liable for any charges racked up on a counterfeit, lost or stolen card by someone other than the cardholder, according to Jerry Smith, who runs the Arizona payment office of First Data subsidiary Ignite Payments. EMV stands for “Europay, MasterCard and Visa,” but associations like Discover and American Express are on board with the technology too. It’s set to affect 1.2 billion U.S. cards and 8 million point-of-sale terminals and cost merchants and issuers $6.8 billion, according to Smith. Technically, the cost falls to whichever party between the card issuer (for example, Chase) and the merchant (for example, Walmart) failed to update their technology to handle the new standard. If a card issuer hasn’t replaced their customers’ cards with chipped ones, the liability is theirs. If the card has been upgraded but the merchant swipes the stripe instead of the chip — whether because they forgot or don’t have the proper equipment — the costs are the merchant’s, according to Smith. The terminals must be certified, not merely “capable,” or you could still be stuck with the bill even if the chip is used, Smith said. Though “a lot of processors are selling fear in response to the EMV launch,” according to Smith, the truly certified machines have been subjected to a stringent process which can take between four to six months for their manufacturers to get the nod. “It is not a point-and-click process,”he said. What about those card readers which plug into a smartphone? EMV-ready options do exist, including from the commonly used manufacturer Square. However, Smith took a jab at Square’s sale of customer details to telemarketers and promoted First Data’s competing “Clover” technology. “EMV is going to impact all of us in one way, shape, or form,” Smith said, and customers can also be held responsible for some of the costs. However, it shouldn’t be much different from what’s going on today. A customer can be liable for up to $50 on a credit card, zero if the card was already reported lost or stolen. There is no liability for a cardholder if their plastic is used in a “card not present” transaction — such as buying stuff online. Chipped debit cards also carry no liability for a cardholder if they’re reported lost or stolen first. Otherwise, you’re on the hook for $50 if you report it within two business days. That amount increases to $500 if you report the loss/theft after two business days but less than 60 calendar days. If by Day 60 or beyond you haven’t reported the card’s absence — which Smith called highly unlikely — you’re liable for any costs incurred by whoever has it. 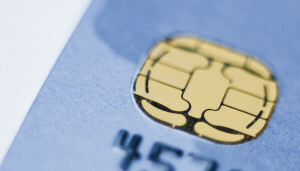 A staple in Europe for a while, the EMV chips are “virtually impossible to duplicate” compared to the fixed, 16-digit numbers in the 45-year-old magnetic strip technology. “I’m surprised it’s taken this long to make it to the states,” he said. On the flip side, “card not present” (think online transactions, for example) fraud is expected to rise from $3.1 billion in 2015 to $6.4 billion in 2018, as thieves move to the “path of least resistance,” according to Smith. “That is a very, very nice safety net,” Smith said. Smith, whose parent company processes 70 percent of all credit card transactions in the U.S. — think of it as the step below the credit card companies themselves — said that service businesses like body shops aren’t as great a target as retailers. Still, we thought it was important to remind shops of the change and encourage them to contact their processor for more information about what’s best for their business. You can also contact First Data. The Society of Collision Repair Specialists has a program which would earn a $200 credit and offers a dedicated account rep for members. Details: Members can call Ken Keifer at 424-903-6877 or email ken.keifer@firstdata.com for more information.